Do You Dance with Fear or Trust? Before I moved to Colorado from Massachusetts, I called a UPS Store in Denver to arrange a mailbox rental until I had an address. The guy on the phone asked me for my name and phone number to reserve it. His voice was upbeat, as if he were having the time of his life. “Don’t you want more formal identification?” I asked, incredulous. And why did he sound so happy? (Colorado had not yet legalized marijuana). In the Boston area I had gotten accustomed to both the ambient crotchetiness and needing to either offer official proof of my identity or reassure others I was “OK” by virtue of where I lived, my education or other external marker. Trust was earned, not granted. I hung up and wondered if Coloradans were crazy to be so trusting or if the Red Sox nation was so guarded as to be paranoid. When one swims in fear-based waters, being cautious seems normal whereas being more open or trusting than the culture seems “foolish” or “stupid”. People might take excessive precautions against overestimated dangers to avoid “looking bad” in the eyes of others; their physical safety is likely not at risk, but their egos are. In Massachusetts, I noticed an undercurrent of blaming or shaming if someone were victim of a theft, as if they “should have” been more vigilant. Avoiding so-called negative outcomes, even at the cost of greater spontaneity, seemed to take a higher priority than letting life take its course, bringing with it the delightful, the dastardly and everything in between. Last month, a friend (also a transplant from Massachusetts) commented on Facebook that she was selling stuff on Craigslist, as I was. One woman from Boston chimed in, “Make sure your husband is home when people pick up items.” There was a time I might have agreed, but I found myself shaking my head. As someone without a husband or partner, I wasn’t sure what her advice implies for the single gal (she then suggested having a friend around; I’m not sure I buy that, either). Trust, I find, plus intuition and discernment, are enough in most circumstances. Had I listened to the wailing chorus of fear in my head, I never would have walked the Camino de Santiago which, for me, turned out to be a 520-mile corridor in which to open into greater trust. Still, since my return from Spain, old habits of mind sneak in occasionally. Now, at least, I can more quickly discern when I’m floundering in fear, relaxing into trust, or dancing in between. Vigilance, supposedly for our benefit, comes at a price. The accompanying muscular contractions and conditioned wariness contribute to low level exhaustion, rigidity and anxiety. Maybe vigilance demands a person carry too much responsibility, or stuff in their purse, leading to poor posture and heaviness in the body. As I unravel these holding patterns and the stories they contain through the Feldenkrais Method, I find I’m naturally more willing to trust when in the past I might have relied more on my mind than my body’s innate intelligence to guide me. In my own Craigslist adventures, I let strangers into the house I was sharing to peruse my bead collection (this was not a leap, since my housemates and I never locked the house in the first place, even at night). The biggest danger, as it turned out, was people wasting my time by either not getting back to me, canceling appointments or appearing with insufficient cash in an attempt to cajole me into making a deal. 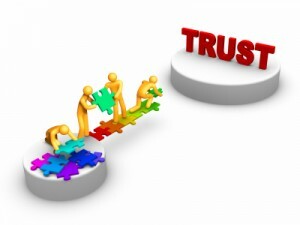 The more I trust, the more I want to associate with other trusting people. To be trusted in this culture almost feels like an honor, a silent pact between open-hearted travelers who drink sparingly from the Kool-Aid of suspicion, if at all. While looking into housing arrangements on Craigslist for a stay in Santa Fe, I spoke to a few sub-lessors. One, even after a friendly 45 minute Skype video meeting in which she said she felt very good about me, requested references. A cloud passed over her formerly animated face when she asked. I wasn’t sure which fear of hers would have been assuaged by another’s opinion or if she was listening to an old voice in her head about what she was “supposed” to do. Another woman, after a brief phone call, offered me her place on the spot, refused my offer to Skype and even cancelled an existing AirBnB reservation to accommodate my dates (the guests she cancelled, being understanding, still offered to leave her a positive review). That she heeded her intuition made our interaction seamless and made me feel better about renting her place, even though it cost more. As my Zen teacher likes to say, “What you practice is what you have.” Practicing fear might have gotten me to this point, but from now I’d rather practice trust. Go ahead, call me crazy. I rarely have reason to fear. Even when I am among people whom society categorically rejects, I can count on most to come to my assistance, if I should need it. Institutions and communities really do have spirits. ‘Stay away from those which don’t uplift’ is my modus operandi. What a great modus operandi! Recently I have been trying to communicate more with the strangers I see every day walking round the city. I offer a hello, a smile or a wave and the majority of strangers respond positively. When I see a bearded man in shalwar kameez with the joie de vivre of the late Ayatollah Khomeini smile back at me it is a reproach to my assumptions. It’s also very Feldenkrais, to orient to our environment by acknowledging and knowing who is in it. Because our culture has isolated many people and making them believe they are separate from others, fear can spread more easily. I recently read a fascinating book, Mind by Dan Siegel. He’s a psychiatrist & psychotherapist who argues that our minds must be more than what is inside our skins as that neglects our social connections. I have been saying this for years and Dan makes a good case. He has worked a fair bit with the Dalai Lama and that made me assume the best in him.